Here's some things we know: Chris Kyle was a decorated American solider, a Navy SEAL who was considered the deadliest sniper in U.S. combat history. A Texan by birth, he did four tours of duty in Iraq. He took a lot of lives, he saved a lot of lives. He was a father of two and a husband. Some say he was a good guy, some chafed at his rougher edges. After surviving war, he struggled with returning home, only to have a marine suffering from Post-Traumatic Stress Disorder murder him. Kyle co-authored a book about his life with two other writers, and that book has now been adapted into a movie by writer Jason D. Hall (Spread) and director Clint Eastwood. American Sniper deals with all of the above, except for maybe any question of whether Kyle was good or bad. That's something that has emerged since the movie came out, as people who remember the man as he presented himself in his autobiography and on talk shows differently than what we see on screen have questioned the movie's veracity. To be honest, I had not read any such criticism before seeing the film. I did, however, watch Eastwood's version and wonder if we were getting the whole story. Was Kyle really such a stalwart figure whose decisive mind and steady hand led to a virtually perfect combat record? It seemed too good to be strictly true, thus sending me to Google. 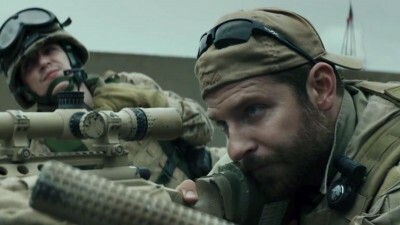 But again, let's look at what we know: American Sniper stars Bradley Cooper as Kyle. Cooper was also a producer on the movie, which suggests a certain commitment to the project. His beefy, Hulked-up appearance would also give indication that he gave a lot to the role. It's an admirable effort that leads to a pretty incredible performance. Cooper is an acting beast in American Sniper. His performance is all-in, submerging any preconceived Bradley Cooper personality, shedding all vanity. This is as far away from The Hangover as the performer could get. And yet, it's not always enough to keep American Sniper on its feet. After a quick run-through of Kyle's early life and the decisions that led him to join the armed forces, Hall and Eastwood divide the film's running time about 70/30 between Iraq and Texas. He marries Taya (Sienna Miller, Foxcatcher) post-9/11 but pre-deployment overseas. When he leaves, she's pregnant with their first child, a son. She has a daughter a few years later. Each time Chris comes home, she tries to make sense of what he's doing and get him to stay. Chris rarely communicates with her about his "work" in ways that extend beyond jingoism. He believes in the "evil" of his enemy and the greatness of America, and his feeling is that were he to abandon his post, there would be no one to step in and fill his shoes. By all evidence, he is extremely good at his job--humble when praised, but righteous in action. We rarely see him doubt himself. He really only questions his actions when children are involved; the rest of the time, he is killing "savages" before they can kill his brothers. There's a lot to parse through when it comes to American Sniper. There are political angles and questions of truth, and then there are just straight-up questions of narrative and dramatic skill. One can surmise that Eastwood's efforts here are utterly sincere. While some may argue that American Sniper borders on propaganda, or that its portrayal of the U.S. belief that our might makes us right is exactly the kind of image that many around the world not only have of the country, but also find hard to swallow, I wouldn't spend too much time trying to dissuade people who decide that to be the case. My defense of Eastwood, thought, is that he is trying to portray one aspect of an American point-of-view as it is, without editorializing . As with last year's Lone Survivor, which to my mind does a much better job, American Sniper is trying to tell the story as it occurred and true to the perception of the participants. The inside view, such as it is. It just so happens that, to outside eyes, some of the things the characters do and say might not be as clear-cut as they see it themselves. Setting all that aside, though, there is much to quibble over in terms of Eastwood's execution. He is not exactly showing himself as a master of nuance with this one. As with most of his movies, his storytelling has an abundance of clarity and a shortage of flash. This works exceedingly well in the combat scenes. The missions Kyle and his team undertake are full of tension, high stakes, and deadly outcomes--though most of the dead bodies are on the other side. Still, as a semblance of what it must have been like over there, it's effectively unglamorous. Added nuance is not necessarily required, and when Eastwood tries to inject it, such as when one of Kyle's platoon questions what they are doing this for, it is unwelcome. Not just by the characters, but by the audience, as well. Eastwood handles human emotion in American Sniper with all the subtlety of a bear trap, and you'll end up wishing he'd just stop stepping in it. The stateside scenes are worse. Cooper and Miller valiantly try to make it work, but they'd be better served acting the scenes out with just a bunch of grumbles and grunts than actually speaking Hall's wooden dialogue. The interactions between husband and wife are neither revealing nor insightful, and Taya is often reduced to being just a stereotypical nag. Even more troubling are the instances when Chris calls her from the field while gunfire is audible in the distance. There's a torturous irony to the fact that he thinks she can't handle the truth of his duties but forces her to hang on the line so she could possibly hear him get shot. It's for those reasons that I ultimately give the thumbs down to American Sniper. Granted, for all I know, that's all painfully accurate, but as moviemaking, it's also painfully bad. It's why the overall portrait of Kyle didn't pass the smell test, why it made me wonder even more how the real man was perceived. Add to all of that the cartoonish portrayal of Kyle's rivalry with his Iraqi counterpart, a shooting contest that lasts the course of his service, and there's just too much tipping American Sniper toward the bad side of the scale to give it a pass. 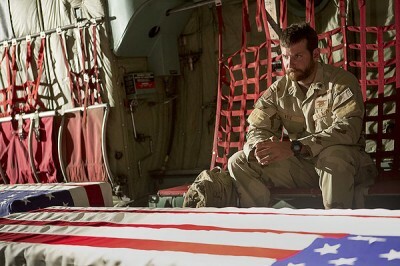 Call American Sniper a well-meaning failure, but a failure all the same, it's good intentions paving the way to its final destination, if not its final box office.